Just look at the colour of this soup! Is it not stunning? I love this healthy combination of vegetables with just a touch of heat and freshness from the lime. If spicy heat isn't your thing, just leave out the chili but don't skip on the lime. You could also use chicken/vegetable broth in this recipe but I think the richness of a beef broth goes well with these strong flavoured vegetables. Enjoy! 1. Melt butter and oil in heavy large soup pan over medium-high heat. Add beets, onions, cabbage, kale, and chili; sauté for 10 minutes. 2. Add broth and bay leaf. If the broth doesn't just barely cover the vegetables, add some water. Bring to boil then reduce the heat to simmer. Cover and simmer until vegetables are very tender, about 45 minutes to 1 hour. Remove the bay leaf. 3. Working in small batches, puree soup in a blender (careful, very hot) until smooth. Return soup to pan and season to taste with salt and pepper. Add the lime juice. 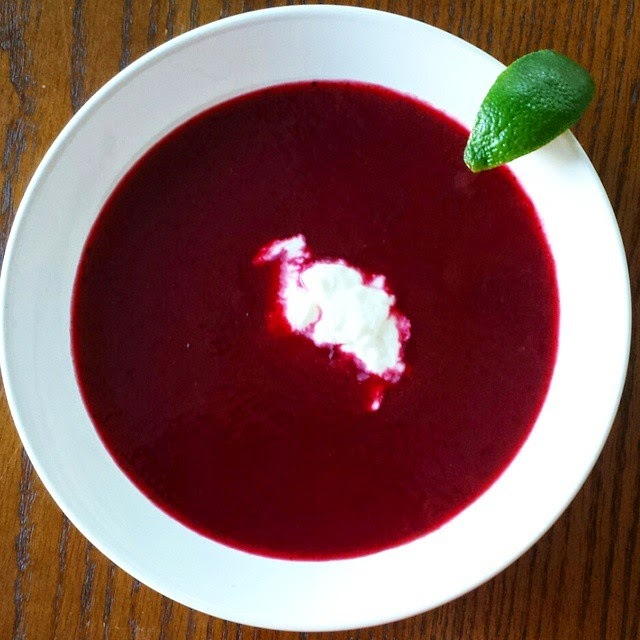 Serve the soup with a dollop of Greek yogurt and a wedge of lime.